When I got pregnant one of my major problem was dry skin. Even if how much I hydrate(more than 1.5l of liquid/day), few hours later it would itch due to dryness. Tried a lot of soaps from the organic ones and gentle skin cleansers available in the market still gave me same unlikeable results. It was during that time that my tita who happened to be my OB gave me samples of Cetaphil cleanser. I tried it on and gave me excellent results. I don't have heavy and dry feeling after washing my face and also my body. Plus it doesn't have a strong scent that would cause irritation if your skin is sensitive and allergic to harmful ingredients. When I gave birth to my babies, the hospital used a different cleanser it came to a point when my baby girl had redness all over her face that I thought it was due to allergic reaction from her antibiotics that time. When I asked her pedia about it, she said it was due to dermatitis which is caused by the cleanser they are using. So from then on, I used Cetaphil for her and even for my first born. Their skin is healthy and never a time that occurred dryness. 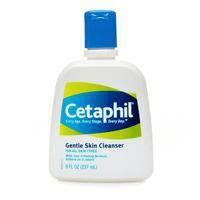 There are pros and cons of this Cetaphil cleanser which I will list below. Doesn't leave a sticky feeling your skin after using. Doesn't have heavy feeling after washing your skin. Doesn't leave dryness and remains hydrated after long hours. Doesn't have strong smell that would cause skin irritation. The liquid doesn't contain artificial colors also that could cause irritation/allergies. Can easily be rinsed off from your skin. Well I can only list one con, which is the price. It's a bit pricey for a 60ml skin cleanser which costs about less than php100 from drugstores. But no matter how costly it is I won't compromise my skin as well as my babies. Now it's your turn to have an effortless soft and healthy skin. Visit Bebengisms blog for a chance to win Cetaphil's skin treats promo. Yes that easy! Just follow the instructions for you to win the get away from Cetaphil and win Cetaphil products. For more details visit Joel Andrada's twitter account and Cetaphil's fan page here. Goodluck! How about you? Have you tried Cetaphil? Share your thoughts.